Amid giant skyscrapers, hundreds of protesters’ chants echoed off the office of Jeff Sloan, the chief attorney for negotiations on March 11, calling demands for fair faculty wages and stronger support of higher education for both cultural enrichment classes and careers-oriented classes. 24 participants were arrested toward the conclusion of the protest, many of them faculty, for staging a sit-in in front of Sloan’s office. 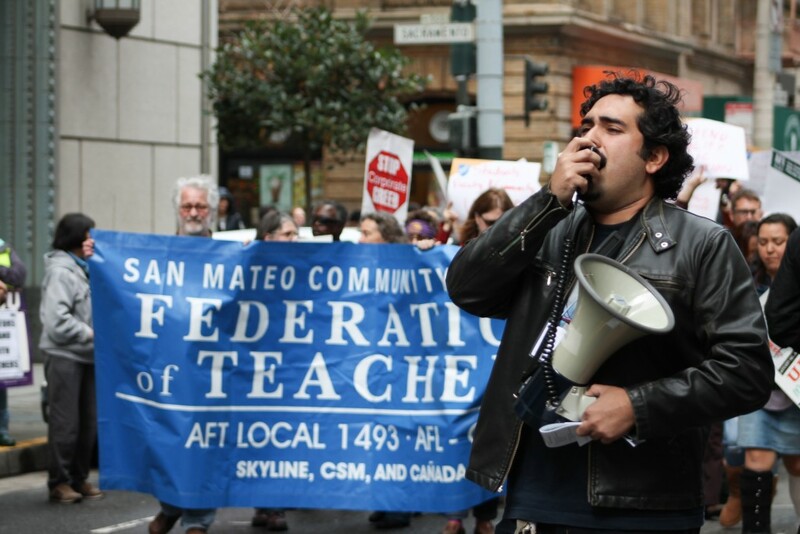 The tactic highlighted the faculty’s goal of pursuing a wage increase and underlines the faculty’s determination to the keep the college open and accessible to everyone interested in education in the Bay Area. City College Board of Trustees President Rafael Mandelman echoed Killikelly’s sentiment. Neither City College’s marketing and public information director nor Sloan’s office responded to requests for comment. City College faculty took a wage cut in the aftermath of the recession at the recommendation of Accrediting Commission for Community and Junior College (ACCJC), leaving faculty wages 3.5 percent below 2007 levels. 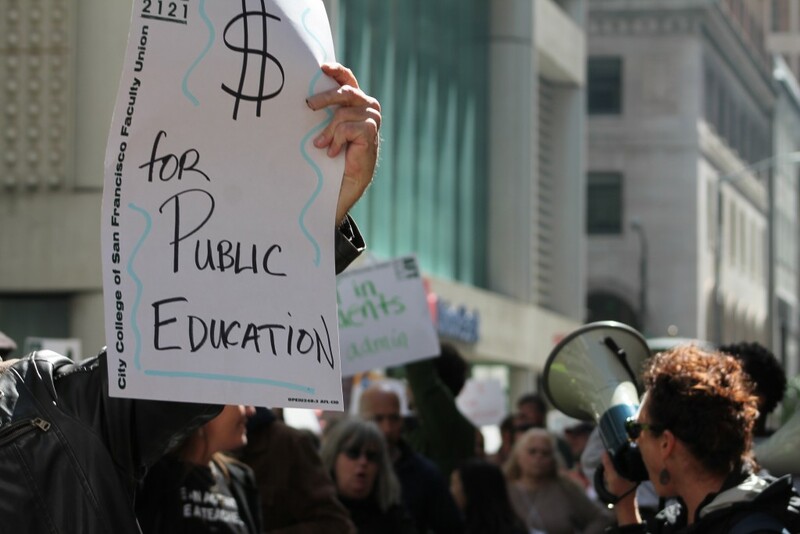 Now faculty is insisting on fair wages that not only reflect their professionalism, but also address the rapidly escalating Bay Area cost of living. The San Francisco Community College District has offered only modest pay increases so far, while simultaneously putting forward the 26 percent reduction in class offerings, mainly citing lower enrollment figures which have declined by approximately a third since 2012. The union fears that fewer class offerings will inevitably lead to faculty layoffs. Protesters assembled outside of the Hyatt Regency, where the California Federation of Teachers’ (CFT) annual convention was concurrently being held. They marched through the downtown streets until they arrived at the block where Jeff Sloan’s office is located. Protestors began to circle in the street as the police blocked traffic. 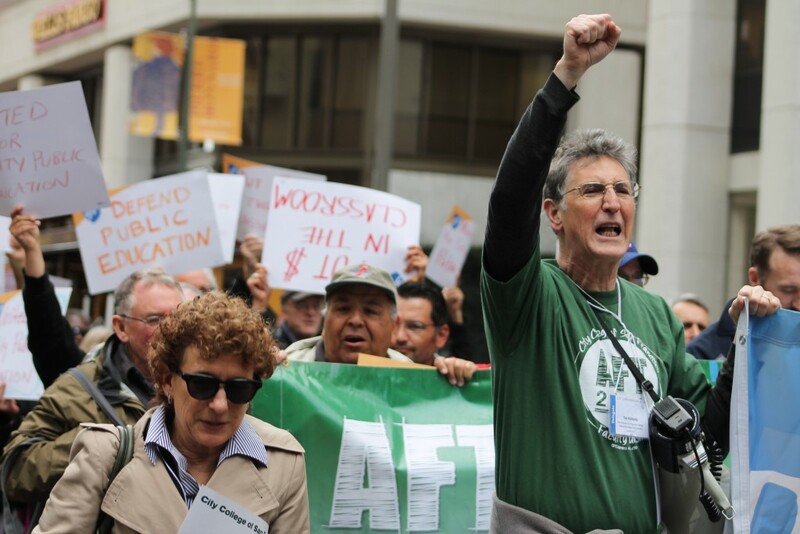 Many conference participants as well as a diverse range other workers joined City College faculty in the march sponsored by the AFT Local 2121. Killikelly said the union demonstrated an act of nonviolent “planned civil disobedience” by purposely blocking the doorway of the attorneys hired by City College to sit in negotiating sessions. The attendance of attorneys at meetings is a relatively new phenomenon that began during the accreditation crises, Killikelly said. After roughly an hour, the police officers approached the sit-in protesters one-by-one, informing them they were trespassing. They each acknowledged their willful violation before they were handcuffed. None of them resisted arrest. They were taken to San Francisco Police Department’s Central Station, where they stayed for around one to two hours. Killikelly hopes the demonstration sends a message that will be heard by the district. “They need to understand that there will be no more business as usual and they can expect other things to be happening during the semester,” Killikelly said.